Happy St. Patrick's Day! Today I'm wearing green for the holiday, and we just finished up a fun St. Patrick's Day party at the office, complete with green velvet cupcakes from Piece of Cake. It was so difficult not eating one, but alas, they were not gluten-free. I do not have a drop of Irish blood, but I felt sort of Irish in my green dress and with my reddish hair. I'm really loving the red hair. I think it suits my complexion. You may also notice that I'm wearing something new around my neck. Chapin gave me a beautiful necklace from Three Sisters Jewelry for Valentine's Day. 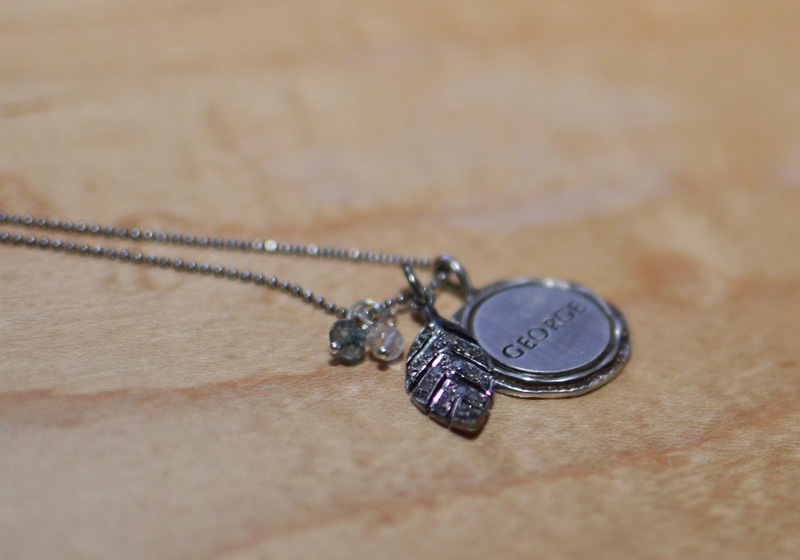 The charm in the middle says "George," and I've included a close-up photo below so you can see the beautiful detail. I have long been a fan of this website for its hand-stamped jewelry. I bought my sister, Laura, a necklace with the name of her son when she had her first baby, and added a new charm when she had her second. I've bought friends gifts from the site as well, some with the names of children, some with their own names! I love personal accessories that not only look great, but also serve to remind you of something wonderful. On that note, I want to thank all my blog readers and Instagram followers who have posted words of encouragement and support over these last few months. Reading those comments has meant so much to me. I know I'm lucky to have people in my life - some whom I've never even met! - who care about me and how I'm feeling. Welcome back! Hope you continue to bounce back. Life just constantly changes,doesn't it? Some for the good, some that just about do you in . At any rate, glad to be getting my dose of 'Fashionista' again !